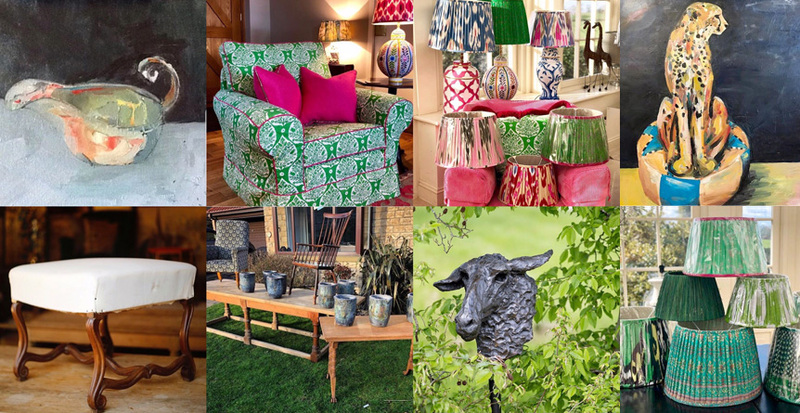 An evening of Interiors Inspiration with Hobby Horse Art, Fenella Interior Design and Tallboy Interiors. Sasha Ibbotson has gathered together some great local businesses that you’ll want to know about if you’re planning on updating your interiors, adding a ‘wow’ factor….or simply want some inspiration for your home. Tickets will be limited for this event & available in advance only. Join us for a glass of fizz while you peruse a wonderful collection of art, antiques, lamps and lampshades etc. A wonderfully relaxed and fun evening as we head in to Spring and banish our winter blues! Once you’ve had a good look at what’s on offer then join us for a one course dinner followed by coffee & something sweet, (included in the price). Fenella Interior Design has an amazing selection of colourful lampshades and lamps that will transform any space. Based locally, she can make any lampshade, large or small as well as being able to help in much bigger interior projects….she’s all about colour! As for Hobby Horse Art, set up by Millie Seligman last year, Millie has curated a wonderful selection of artists from around the country for her online website…but tonight she will have a selection for you to see. She has a wonderful selection of classical and modern pieces, large and small….it’s amazing how a space can be transformed by hanging a different picture. As for Matt from Tallboy Interiors he has a wonderful selection of modern and antique furniture that he buys from all over the country and abroad.. Most recently he’s supplied some wonderful key pieces into the revamped Talbot Hotel, Malton. Come and be inspired and gather some names and addresses for your little black book. Spring is the perfect time to revamp your home and you’ll certainly be inspired to fill your home with some beautiful things.